Last year, NASW-Michigan released "Better Health, Better Health Care, and Reduced Costs: Integrating Community Supports into Michigan’s Health Care System," which makes the case for integrating social workers and community health workers into Michigan's primary care system. Additionally, it provides the foundation for the Community in Primary Care (CPC) model, developed by NASW-Michigan, with the goal of a pilot project followed by statewide implementation. We have partnered with the Mid-Michigan Physicians Group to pilot the model and the Curtis Center Program Evaluation Group to evaluate the pilot program. Shortfalls in health care account for about 10 percent of early deaths, while genes, social circumstances, and behavioral and environmental factors account for the remaining 90 percent. The goal of the CPC model is to address these other factors. CPC brings a renewed emphasis on primary care as a comprehensive health and social service delivery structure that reaches beyond the clinical setting. By connecting neighborhoods, homes, community and social resources, physician offices, clinics, and hospitals, CPC will improve health, reduce disparities in population health, and help control the costs of care (the Triple Aim). 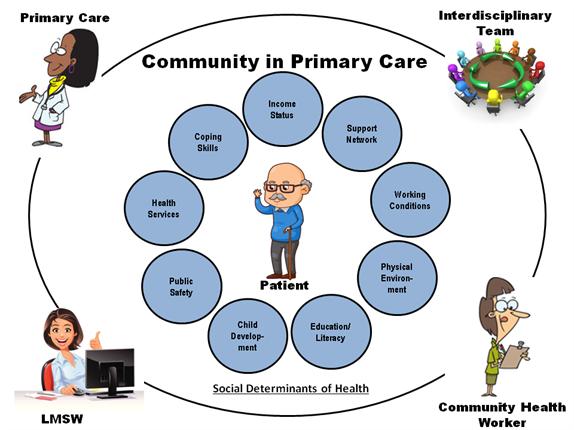 CPC works to achieve the Triple Aim by putting social workers inside of the primary care clinic, working directly with physicians and as part of the interdisciplinary team, to address the social determinants of health. Community health workers work side by side with patients helping them to navigate systems and carry out the care plan developed by the social worker. The CPC model takes primary care beyond the traditional four walls of the office and into the community to overcome barriers to better health. While working with the community health worker, social worker, nurse, clinical provider, and other team members, the patient is connected to services that address physical, social, and environmental aspects of their health. making the case for a sustainable payment policy that reimburses community support professionals for their contributions to the health and social service delivery team through payment mechanisms such as Medicare, Medicaid, and private insurance. Read "Better Health, Better Health Care, and Reduced Costs: Integrating Community Supports into Michigan’s Health Care System"
Read more about the CPC model here.